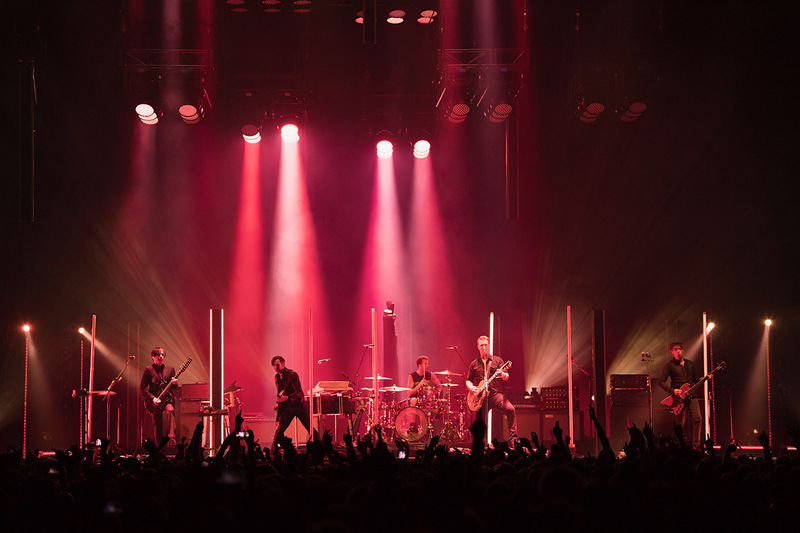 If there’s one band you can expect to put on an astounding rock show, you’d better believe it’s Queens of the Stone Age. As droves of fans piled in for the second Melbourne date of their Villains World Tour, the air was palpable with anticipation for the Californian five-piece to hit the stage. C.W. Stoneking kicked the night off on a high note with a soulful 40-minute set. While on paper the blues powerhouse may not seem like the most logical opener for a heavy rock show, he made for a surprisingly excellent choice. Stoneking and his band powered through a dynamic setlist of Americana jams, swing bops and infectious grooves that well and truly warmed the crowd up. Kudos must be given to the four backup singers joining Stoneking on tour, who added a stunning depth and vibrancy to each song. Before long, Queens of the Stone Age took to the stage with an ‘A Clockwork Orange’ inspired entrance; a recording of ‘Singing In The Rain’ bleeding into ominous strings as the stage and audience were saturated with blinding white lights. The shift in energy was unmistakable as punters recognised the opening riff of fan-favourite ‘A Song for the Deaf,’ the standard welcoming cheers quickly becoming an excited roar. When the band followed up immediately with ‘Do It Again,’ it was clear that this would be a show the diehards would enjoy. Queens’ frontman Josh Homme announced his pleasure with the crowd’s energy so far, exclaiming several times that “this is already better than last night!” He then encouraged anyone in seats to defy the security guards and come down to dance—continually instructing security to step aside until finally the fans were allowed to swarm down onto the floor. From this point, the audience was electric and willing to follow Josh anywhere he saw fit. The band marched through two tracks from the very danceable ‘Villains’ before ripping into the frantic mosh pit anthem ‘Millionaire’ and big hit ‘No One Knows’—which I’m sure many expected to close the set. Here’s where the full band got their chance to shine, with extended solos from long-time Queens guitarist Troy Van Leeuwen and drummer Jon Theodore (ex-Mars Volta). The band continued to surprise the crowd, pulling out deep cuts such as ‘Turnin’ On The Screw,’ slow ballad ‘In The Fade,’ and ‘Burn The Witch’—the latter featuring punters singing its catchy riff for almost the entire song. More sing-a-longs were in order for ‘Make It Wit Chu,’ with Josh leading the men and women in back and forth shots at the chorus before bringing it back to the high-energy mosh music that kicked off the set. ‘Little Sister’ and ‘Go With The Flow’ provided the false-finish before the energetic encore of ‘Regular John’ and ‘Song For The Dead’—a fitting bookend to the show’s opening song.